Shortly after the fall of the Third Reich, the Bizone, or the Allied Military Government (AMG) of the United States and Great Britain, was established. 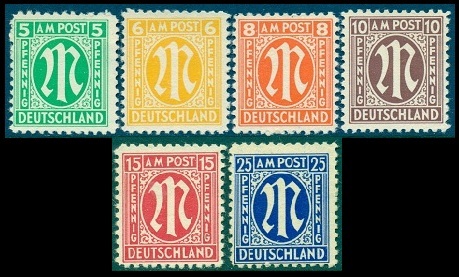 This zone issued the following series of stamps for civilian use in the occupation areas of West Germany that were under its control. There were three different printings of these 1945 stamps. The earlier printings were the Washington and London Printings (March - September). The later printing was the Brunswick (Germany) Printing (August - December). For presentation purposes, the Brunswick printing is presented first, as it is comprised of all the possible denominations of this issue. The military governments of the Soviet and French occupation zones issued their own postage stamps during 1945. 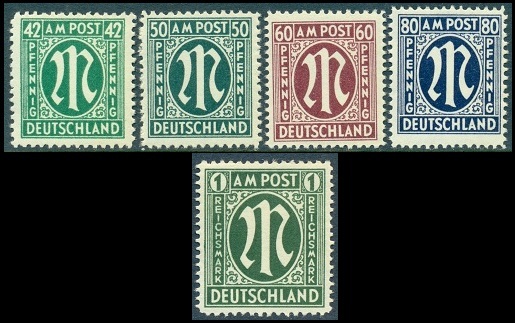 The Brunswick Printing, containing the complete run of all twenty stamp denominations, is shown above (Mi. #16-35, Sc. #3N1-20). This printing was lithographed on medium paper with white gum, and the stamps were all perforated 11, 11 1/2, or compound. As this printing was issued towards the end of 1945 and the AMG issues were replaced at the beginning of 1946, all of these denominations in used condition are very scarce. The 80 Pf. 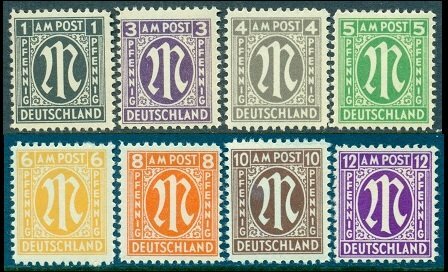 and 1 Reichsmark denomination stamps, in used condition, are rare. These stamps also exist imperforate and part-perforated. The Washington, D.C. Printing consisted of the 3 Pf. to 15 Pf. and the 25 Pf. denominations (Mi. 1-9, Sc. #3N2a // #3N13a). 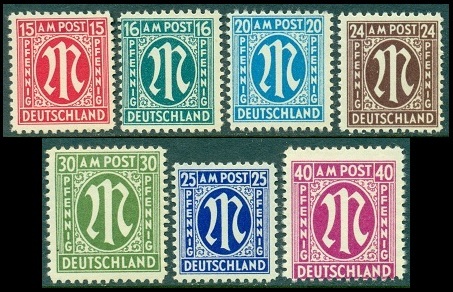 These nine stamps are lithographed on thick paper with white gum, and they are all perforated 11. All of them, except for the 3 Pf., 4 Pf., and 12 Pf. denominations, are shown above. There are also minor design differences between the Washington and Brunswick Printings. The London Printing consisted of the 3 Pf. to 8 Pf. and the 12 Pf. denominations (Mi. #10-15, Sc. #3N2b // #3N8b). These six stamps were printed in photogravure on medium paper with yellowish gum, and they are all perforated 14, 14 1/2, or compound. The 3 Pf., 6 Pf., and 12 Pf. denominations are shown in the image above. Between 1946 and 1948, the Bizone AMG issues were replaced by those of the Allied Occupation - General Issues.